Definition at line 42 of file llmorphview.h. Definition at line 70 of file llmorphview.cpp. Definition at line 57 of file llmorphview.h. Definition at line 89 of file llmorphview.cpp. Definition at line 84 of file llmorphview.cpp. Definition at line 97 of file llmorphview.cpp. References ANIM_AGENT_BODY_NOISE, LLAgent::changeCameraToDefault(), gAgent, gCamera, LLAgent::getAvatarObject(), LLCamera::getNear(), LLViewerObject::isDead(), mCameraDist, mCameraPitch, mCameraYaw, mOldCameraNearClip, MORPH_NEAR_CLIP, LLVOAvatar::mSpecialRenderMode, LLCamera::setNear(), and LLVOAvatar::stopMotion(). 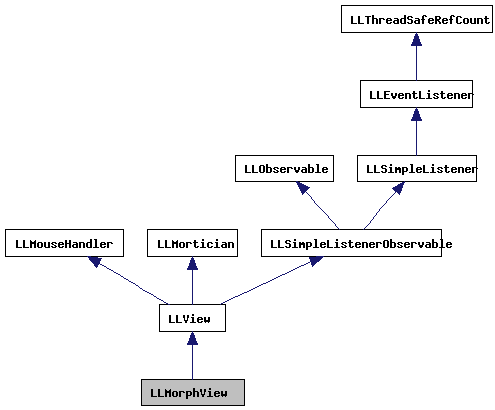 Definition at line 61 of file llmorphview.h. Definition at line 205 of file llmorphview.cpp. Referenced by edit_avatar_move_backward(), edit_avatar_move_forward(), edit_avatar_spin_ccw(), edit_avatar_spin_cw(), edit_avatar_spin_over(), edit_avatar_spin_under(), and LLToolCamera::pickCallback(). Definition at line 59 of file llmorphview.h. Definition at line 56 of file llmorphview.h. Referenced by LLPanelEditWearable::setSubpart(), and updateCamera(). Definition at line 60 of file llmorphview.h. Definition at line 139 of file llmorphview.cpp. References LLFloaterCustomize::fetchInventory(), LLView::getVisible(), gFloaterCustomize, gFloaterView, initialize(), llassert, NULL, LLFloater::open(), LLView::removeChild(), LLView::setVisible(), shutdown(), LLFloaterCustomize::switchToDefaultSubpart(), and LLFirstUse::useAppearance(). Referenced by LLAgent::endAnimationUpdateUI(), LLViewerWindow::initWorldUI(), and LLViewerWindow::~LLViewerWindow(). Definition at line 121 of file llmorphview.cpp. References ANIM_AGENT_BODY_NOISE, gAgent, gCamera, LLAgent::getAvatarObject(), LLViewerObject::isDead(), mOldCameraNearClip, LLVOAvatar::mSpecialRenderMode, LLVOAvatar::onCustomizeEnd(), LLCamera::setNear(), and LLVOAvatar::startMotion(). Definition at line 174 of file llmorphview.cpp. References gAgent, LLAgent::getAvatarObject(), LLAgent::getID(), LLVOAvatar::getJoint(), LLAgent::getPosGlobalFromAgent(), LLVOAvatar::getRootJoint(), LLJoint::getWorldPosition(), LLJoint::getWorldRotation(), mCameraOffset, mCameraPitch, mCameraTargetJoint, mCameraTargetOffset, mCameraYaw, LLAgent::setCameraPosAndFocusGlobal(), setCameraTargetJoint(), LLVector3::y_axis, and LLVector3::z_axis. Referenced by setCameraDrivenByKeys(), and LLPanelEditWearable::setSubpart(). Definition at line 80 of file llmorphview.h. Referenced by initialize(), and setCameraDistToDefault(). Definition at line 82 of file llmorphview.h. Definition at line 73 of file llmorphview.h. Definition at line 68 of file llmorphview.h. Referenced by setCameraOffset(), and updateCamera(). Definition at line 76 of file llmorphview.h. Referenced by initialize(), and updateCamera(). Definition at line 67 of file llmorphview.h. Referenced by getCameraTargetJoint(), setCameraTargetJoint(), and updateCamera(). Definition at line 69 of file llmorphview.h. Referenced by setCameraTargetOffset(), and updateCamera(). Definition at line 77 of file llmorphview.h. Definition at line 72 of file llmorphview.h. Referenced by initialize(), and shutdown(). Definition at line 70 of file llmorphview.h. Definition at line 71 of file llmorphview.h.